Nullo Scent Control is a Scientific Scent Block. Want to get closer when hunting whitetail deer? Get hunter scent control with Nullo! "I shot this deer with a muzzle loader after eating Nullo for about 4 days. He walked within 50 feet of me and never knew I was around. Eight points and 150 lbs. All I can say is WOW!." - W.W.
Nullo is Hunter Scent Control That Works! Nullo has a proven hunter scent control formula. It comes in a caplet form containing the main ingredient chlorophyllin copper complex designed to block scent by neutralizing body odors from the inside out. 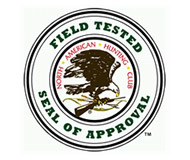 Nullo has been proven by hunters around the world to eliminate scent from their breath and sweat and Nullo proudly carries the “Field Tested - Seal of Approval” of the North American Hunting Club. Differing from other products, which derive their chlorophyll from the alfalfa leaf, wheat grass, or the like Nullo contains a naturally derived water soluble chlorophyllin complex of the highest purity. Nullo uses a unique manufacturing process like no other that produces a safe and effective dietary supplement that agressive hunters use as means to control the emission of human scent when hunting game with a keen sense of smell such as whitetail deer. Try Nullo – you will soon find out that Nullo really works as a scent blocker. Nullo allows the hunter to get closer to trophy deer, hogs, and other game that use the ability to detect scent to avoid being harvested. Getting closer to the game makes for a much more enjoyable and successful hunting experience. Nullo’s success is largely due to the ingredients used and the formulation process observed. Chlorophyllin has been approved by the Food and Drug Administration as safe and effective. No adverse reactions with other medications has been found. For the best results, most people will take one caplet in the morning and one at night. The dosage may vary with each individuals weight and diet. You may take up to three caplets per day - two in the morning, and one in the evening. Over the five day period prior to the hunt, the body will absorb enough of the primary ingredient to neutralize body odor and block scent. Maintain the same dosage everyday throughout the hunting season because Nullo is water soluble and will flush out of your system within 24 hours after you stop taking the product. Don't leave a scent trail while scouting your favorite areas. Take two and call the taxidermist in the morning!